Lovely Mums will be available for purchase on March 15th. Lovely Mums comes in a 4x6 clear acetate sheet and will retail for $15.00. 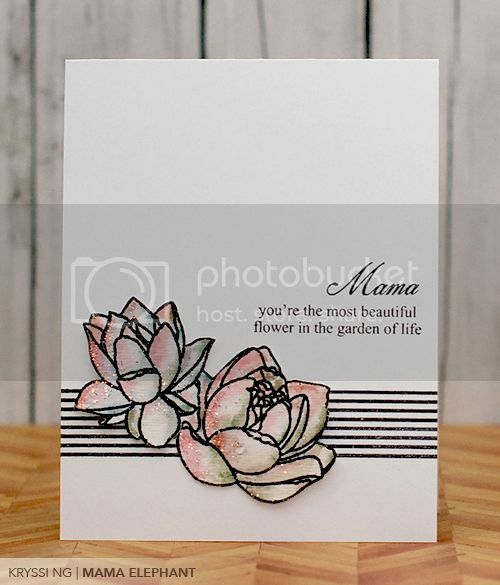 Lovely Mums contains a total of 13 stamps: 4 flower images and 9 sentiment stamps. The largest flower measures 1-5/8" in height and 2-1/8" in width. Mother measures approximate 1-1/4" wide. My first card digs back into my fine arts roots and uses watercolor as the medium. 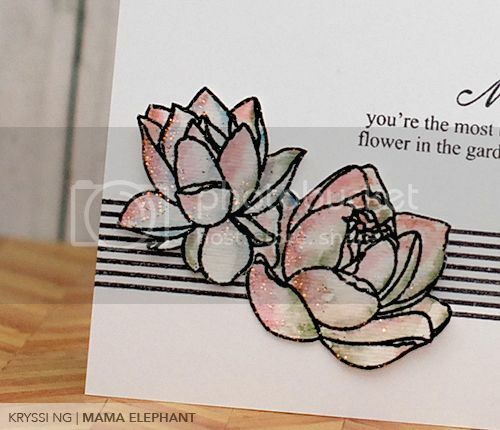 The flowers were stamped with Versamark ink on watercolor paper and embossed with a black sparkly powder. I masked one flower over another so that it remained one piece. After embossing the flowers, I went to work with my watercolors and painted them. Set aside and let dry! If you've noticed I'm not much of a ribbon person, therefore I rely on border stamps like Basic Borders a lot to create a faux ribbon look, without the bulk. I cut the flowers out and popped them up over my card. Finally, I dabbed some glittery Stickles on some areas to give it a bit of shine. 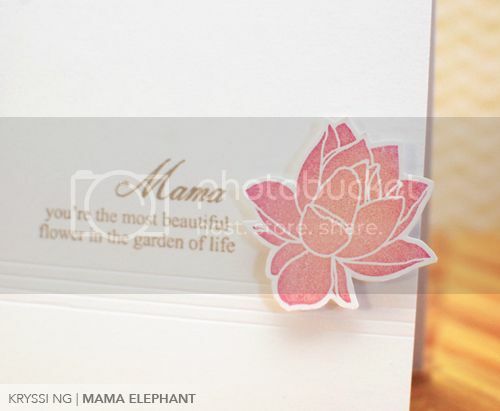 My second card using Lovely Mums features the same sentiment and the reverse solid stamp for one of the flowers. I love the look of silhouettes, you spent all that money on your ink pads, why not put them to use? I kept the card pretty similar, instead of stamping a faux ribbon I scored the lines in. 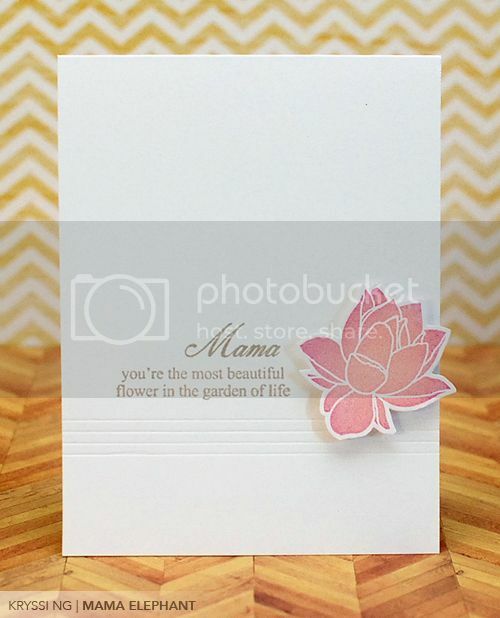 The flower was stamped first with a light pink color, then I went back and inked the edges up in a darker pink color to give it a gradient effect. Closer look, pretty huh? These are absolutely lovely! I love the fact that you can choose to color or to stamp a solid image - versatile. And your "ribbons" look great. I'll have to try that. Your flowers and cards are just lovely! Those are really beautiful cards! I can't wait to see the entire stamp set. Gorgeous flowers - I love the line art and the reverse shadow silhouette! And I'm a non-ribbon gal myself so I adore your alternatives :) Looking forward to the full reveal. What a beautiful phrase - I think I am going to need this set for my Mum.